Bizarre happenings are occurring in the Wheeler household. If you get real still you can hear the Twilight Zone theme song playing in the background. I’m awaiting the aliens who have kidnapped my husband to return him from the planet XOK and switch out this phony they’ve left here. You do know how the aliens function don’t you? The sneak in and steal an earthling, replacing them with a duplicate, who looks and appears like the original, but some things are quite amiss. They haven’t fooled me. I am basing my alien-invasion beliefs on several unexplained occurrences that I am documenting here. 1. My duplicated husband has turned off the T.V. Not just for an hour or two. He has grown tired of the crap. So in place of the constant blah, blah, blah of commercials screaming at us to fit in and buy some dooo-dad or another, we sit in silence. 2. My duplicated husband has ventured to the library and actually checked out books. After a couple of days of silence, he said he needed something good to read. 3. My duplicated husband has completed 2 books. With words. 4. My duplicated husband has declared The Antique Stores as his new favorite stomping grounds. He bought a coal oil lamp, and has been reading by it. 5. My duplicated husband is shaving the old-fashioned way by swirling a shaving brush in a mug with shaving soap. Oh, and he’s buttoning his shirts up all the way to the top. He looks so cute. I just might keep him instead. But what if I’m being a little irrational? Maybe it’s not an alien invasion. 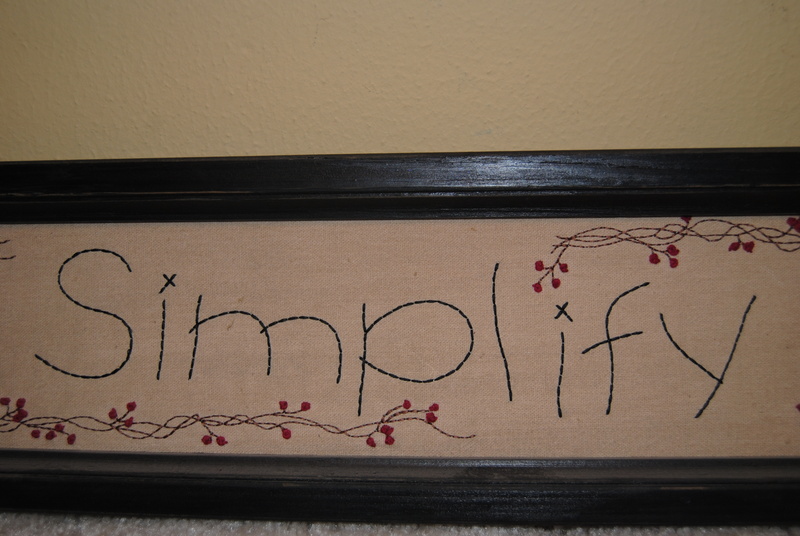 My mantra in life is simplicity. I surround myself with reminders of it. I long for the good ol’ days. I want to gather chicken eggs and milk goats. Can my own food and learn to knit. Go to bed by 8:30 and get up at 5:00. Jason has always longed for the good ol’ days as well. He hates technology and keeping up with the Jones’ mentality. He thinks facebook is the devil. And the three meals of the day are breakfast, dinner, and supper. Not breakfast, lunch, and dinner. Perhaps our battle cry of SIMPLIFY has finally reverberated our ears and sank deep down into our souls and now like the Kundalini serpent has awakened and is uncoiling itself. 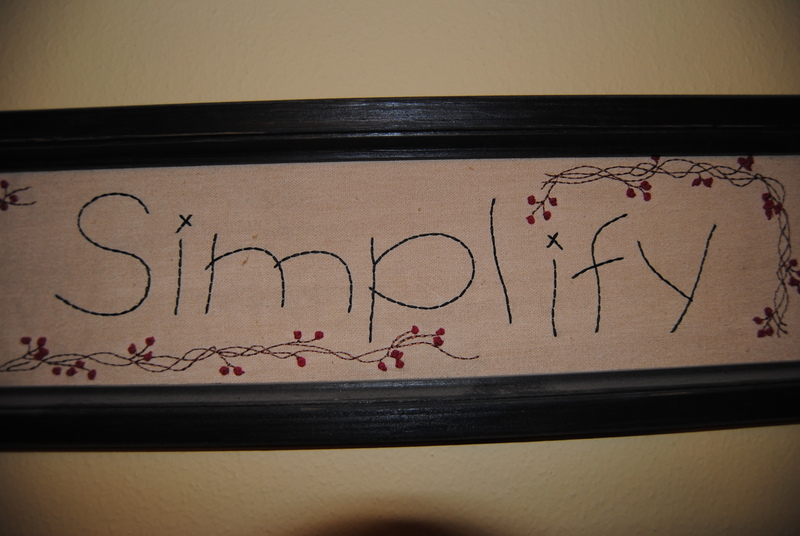 Either way, we are on a mission for simplicity. We are gaining a new lifestyle. We are watering our own little patch of grass under our feet, the world in which we exist. Jason hasn’t gone so extreme as to cut off electricity and running water……yet. I’m not going as extreme as growing dreadlocks and only possessing 4 outfits…….yet. This idea, this concept looks different for both of us. We are searching for a happy medium. For Jason it has begun with something as simple as turning off the T.V. For me it’s going to start with baby steps too. First things first. I’m going to begin uncluttering my life, beginning with my closets and cabinets. Less is definitely more. Instead of working harder and earning more to buy more, we are downsizing and living on less. This may turn out to be a colossal failure. Or it may turn out to be a brand new life-style for us. Only time will tell, but it’s the perfect time with 2011 inching closer and a move to a smaller, trailer house way less than fancy home in the very near future. 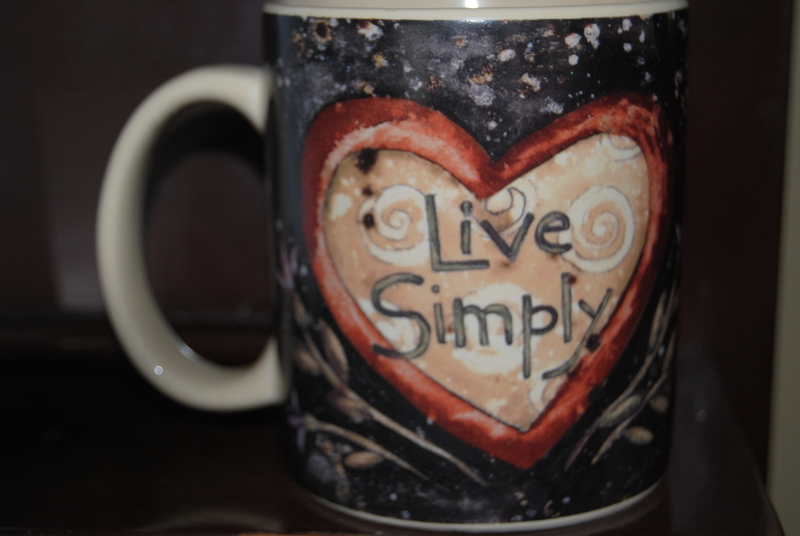 I’m going to blog our journey to the Land of Less is More. It’s looks scary from here. We may even be eaten alive by flying monkeys, but if we do survive, I believe it will be worth it. great blog. i’m happy for the both of you, hope this comes to fruitation.